Philae, the Rosetta mission’s lander, touched down on the nucleus of comet 67P on Wednesday 12 November at 15:34:54 UTC, 16:34:54 CET. The radio signal confirming this unprecedented feat was received on Earth a little later at 16:03 UTC, 17:03 CET. 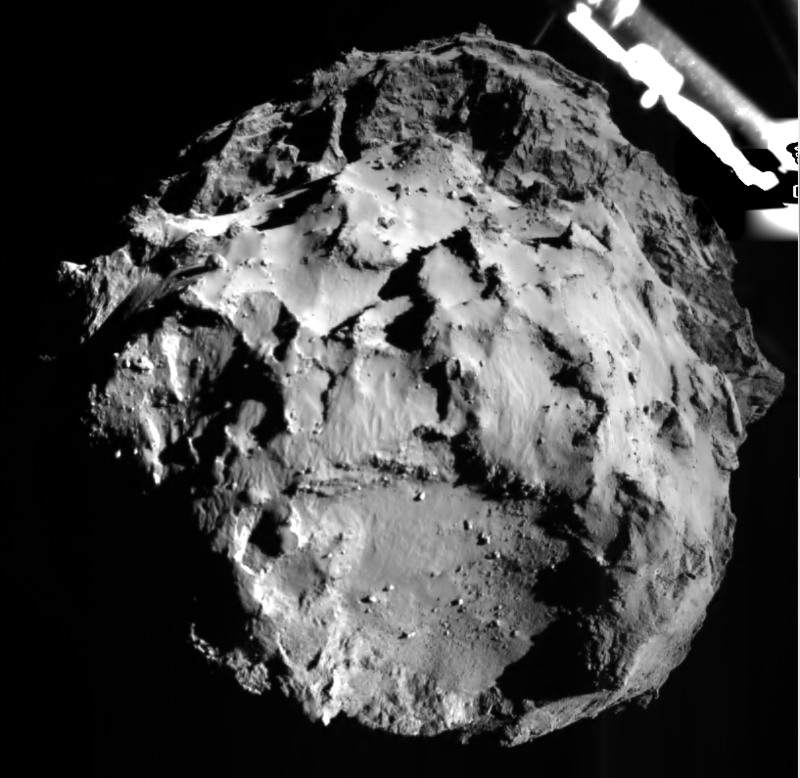 Picture taken during Philae’s descent at a distance of 3 km from the comet’s surface on 12 November. Credits: ESA/Rosetta/Philae/ROLIS/DLR. During the night of 11-12 November, Rosetta sailed through all of the milestones required to give the ‘go’ for Philae’s separation. The lander was released on 12 November at 8:35:33 UTC, 9:35:33 CET and the sense of relief was palpable when the signal confirming the separation was received back on Earth some 28 minutes later. The orientation of the Rosetta orbiter with respect to Philae meant that the two spacecraft were unable to communicate with each other or with Earth for nearly 2 hours. Teams therefore had to wait until 11:00 UTC, 12:00 CET to restore contact with Rosetta and start downloading data from the lander via the orbiter. These data confirmed that Philae’s landing gear had deployed correctly and that the scientific instruments were working. Visual confirmation arrived shortly afterwards with the portrait of Philae taken by the orbiter’s OSIRIS-NAC camera, showing its landing gear deployed and the antennas of the CONSERT instrument. Philae touched down at the Agilkia landing site after a descent of a little over 7 hours. Contact with the surface came at 15:34:54 UTC, 16:34:54 CET, but it appears that the 2 harpoons fired underneath the lander were unable to anchor it securely to the surface, and for now Philae’s exact status is uncertain. The pictures acquired by ROLIS just before landing were successfully received, revealing the surface in remarkable detail, but no 360° panoramic picture that was to be taken by the CIVA camera was received at the SONC operations and navigation centre. It is highly likely that Philae moved across the surface before settling and its precise position and orientation are not yet known. In the hours ahead, mission teams will be working to piece together the timeline of events following touchdown and ascertain the lander’s status during the next communications window between Philae and Rosetta.